Like many corps, Carolina Crown has found that having foreign marchers in the corps can be a culturally enriching experience for all members. This year, eight members from Japan call Crown their home. The corps staff has come to refer to these members as "Team Japan" and one American member has become a personal ambassador to the Japanese members. a mellophone player from Japan. Brad Brackfield from Greenwood, S.C. plays trumpet with the corps and has taught himself conversational Japanese, mostly from books and also from having a Japanese girlfriend. 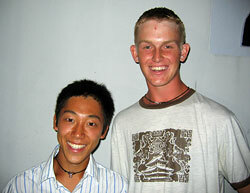 He became interested in learning the language last year when he played host to some Japanese members at his home. He serves as a translator for those in Carolina Crown who don't yet have a command of the English language, translating instructions during rehearsals. "Some things don't translate well, like when the visual staff shouts out for marchers to do a dance position such as a pli?©," said Brackfield. "A good thing about the language issue though, is that when they don't understand the instructions, it forces the staff to explain things in a simpler way. But they are always thrown off when the movement instructors demonstrate movements quickly, as to them it looks like the instructor is just jumping around wildly. They say that the pace used by visual instructors in Japan is much slower and very deliberate." Brackfield found it easy to learn the language because he likes studying Japanese vocabulary and because the Japanese members help him learn how the use the language, while he does the same for them regarding English. "Nozomi, who plays trumpet, is my bus seat partner. We like to play a game where I pick a difficult word out of an English dictionary and teach her how to pronounce it and then explain the meaning and context. She does the same with a difficult word from a Japanese dictionary. We both learn a lot from that." But Brackfield says that the end of the season is bittersweet. "The saddest thing about all this is that we have only three months to develop relations and share our cultures, and then most of the Japanese members are gone from our lives forever." One thing Brackfield has found amusing is the Japanese brought over many of their snacks, such as nori (seaweed), a treat that he says "tastes like the ocean." "They tried getting others to eat it, but no one else would," Brackfield said. "They also have these little dried fish that look like tiny eels. They consider them a delicacy, but I can't even look at them without getting queasy. They get to keep those to themselves. No one else will touch them."